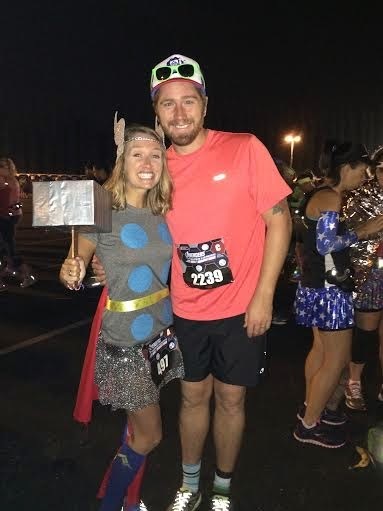 Just in case you missed it, I have already posted about my Costume Creation and the Pre Race Festivities (if you haven't read them yet, feel free to give 'em a quick read). And now it is on to RACE DAY!! I briefly mentioned in yesterday's post, but I'll throw it out there again... 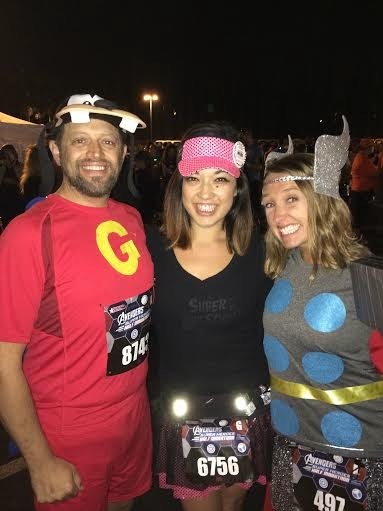 The night before a race (it doesn't matter if it is a 5K fun run, a half I am running with the hubby, or my first full marathon) I can NEVER sleep. I am always freaked out I will sleep through my alarm that I end up tossing and turning and looking at the clock every 15 minutes or so. Saturday night was no exception and when I looked at the clock around 3:15am I finally decided to quit the fake sleeping game and get out of bed. 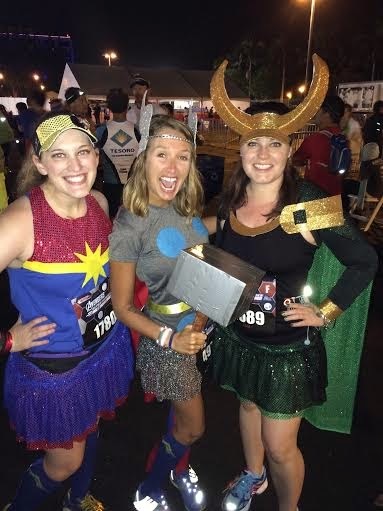 I had chatted with most of my peeps the night before and the majority of us were planning on getting over to the race around 4:45am. The walk to the start from our hotel took about 10 minutes, so I told hubby we needed to leave about 4:20am - which meant he slept till about 4:10am. I forgot to bring anything to eat before the race, so thankfully we got a mini Clif bar in our Expo bags (I normally can't eat much before my runs anyway, so it wouldn't have been a big deal if we didn't have anything). I had Ryan take a couple pictures of me before we left (seeing as I wasn't sure how the costume would actually hold up while running) and then we walked over towards the Disneyland Hotel. THOR rockin' the #TwoPairDontCare look! 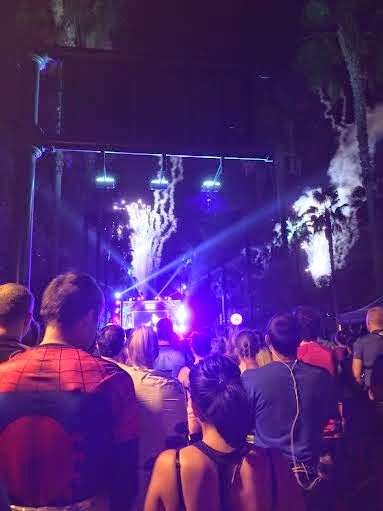 We were going to meet up with Pavement Runner, PointOneMiles, and others at 4:45am under the Sorcerer's Hat. Well, Ryan and I were there around then and the only people there were 1 or 2 Disney employees... I am the type that HATES to be late, so when no one showed up I sent a text and decided to head over and meet up with some other friends in the Family Reunion area. We saw Shelby (and her Sparkly dad), Ivie, AJ, Kara (and her sweet sister Kelly), and loads others! 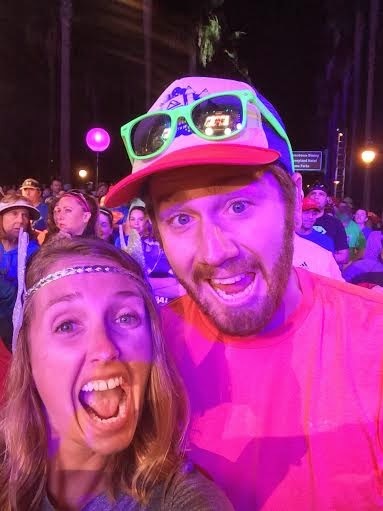 You KNOW we had to document the runDisney shenanigans. 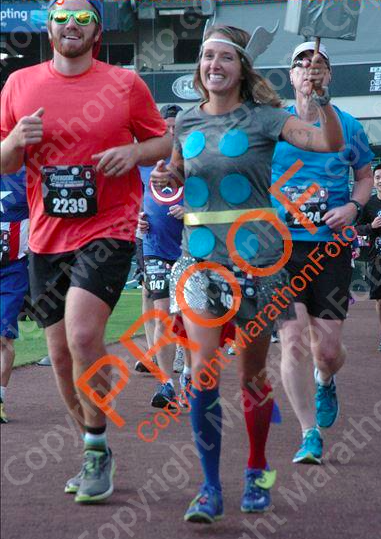 Ryan had to use the porta potties so we headed that way and in the hoards of super heroes we lost everyone. I figured if we stood under the traffic sign directing folks on which way to go to the corrals we were bound to see people. Thankfully PointOneMiles is a head taller than most and I spotted him heading right towards us! 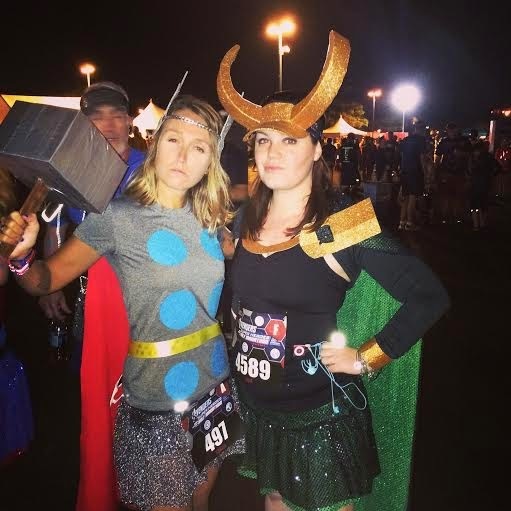 We wished one another luck (those crazy cats were planning on running Avengers and then hoping on a plane to Vegas to then run the Rock 'n' Roll Half Marathon THAT SAME NIGHT) and had to grab another picture before making our way to the corrals. 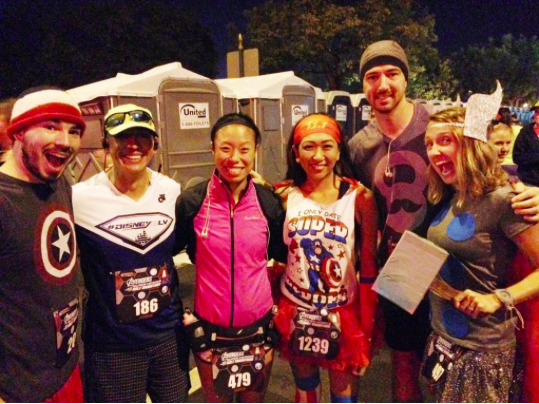 These crazy kids were running this race in the morning and ANOTHER at 4:30pm! Although I was originally seeded in Corral A, I moved back to Corral C so I could run with Ryan (I tell him that if he is willing to sign up for these races with me, then I am willing to run his pace with him). We made our way in and scooted up towards the front of the corral. They mentioned they would be released A and B together, C and D together, E and F together, etc. I figured we would have about 10 minutes between when they let the wheelchair racers go before we would be let go. Since our meet and greets went a little late we were really only in the corrals for maybe 10 minutes before they started the race. While we were waiting to go there were pictures being shown up on the big screen. Ryan asked me how I thought they picked the pictures. I told him I figured they were pulled from the hashtags runDisney told everyone to use. Just as I said that MY picture appeared! The one that I had Ryan take before we left the hotel. HOW AWESOME! I didn't get a picture of my picture on the screen, but did have a couple people ask me if I saw it! 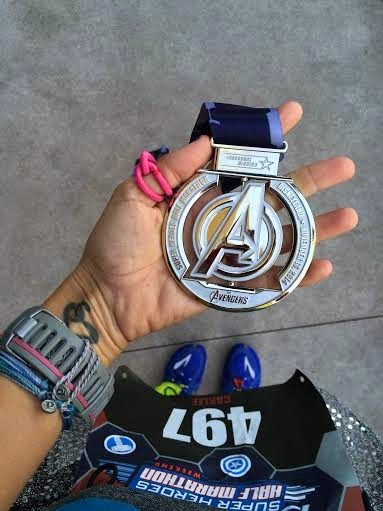 We listened to the National Anthem, saw some fireworks, cheered as corrals A and B were released, moved up towards the starting line, snapped a couple pictures, took one last selfie and got ready to SMASH THE HALF. The "BIG SCREEN" my pre-race picture was shown on! 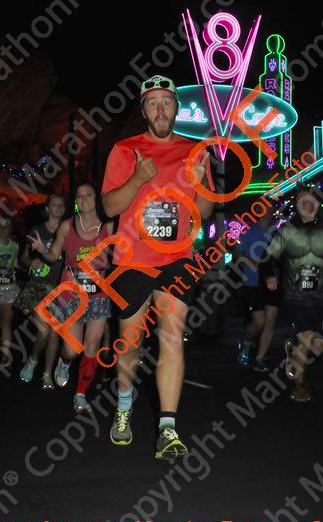 I have run the TinkerBell Half at the beginning of 2013 (my first sub-2 half marathon) and the Disneyland Half Marathon in 2012, 2013, and 2014. I am pretty familiar with those courses and was interested to see how this one would compare. 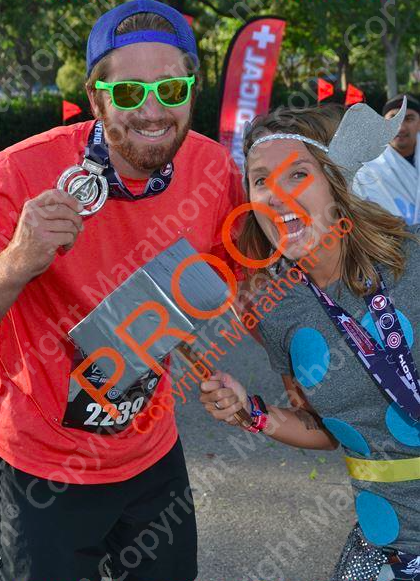 I knew we would have MUCH less park time, that we were running through Angel Stadium (one of my favorite parts of the Disneyland Half course), and that we would have a great time no matter what! The first mile or so was on the streets and then we wrapped through Downtown Disney and into the parks. 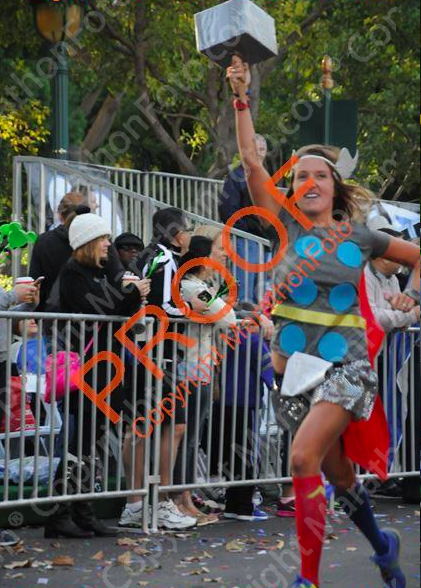 Even though there were only about 1,500 runners in front of us, the lines for the character stops were CRAY-CRAY! 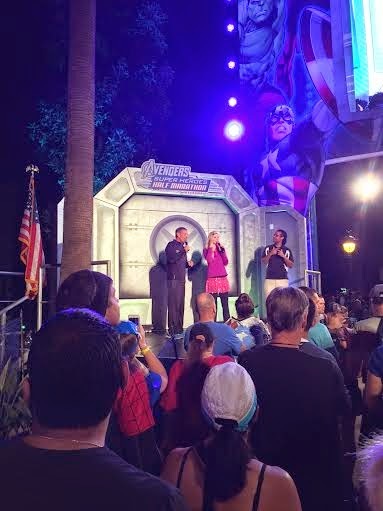 I would say by the time we got to them there were at least 30-40 people waiting to take pictures with the Avengers. 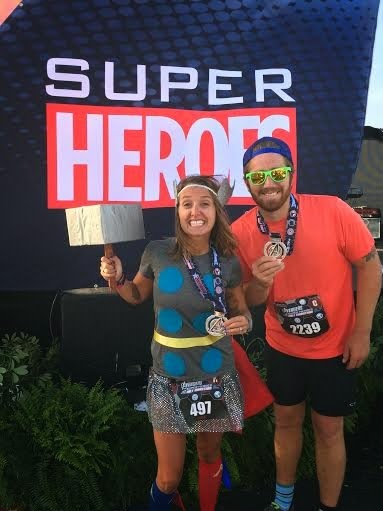 There were a few other characters out on the course (Snow White and the 7 Dwarfs were on the carousel, Minnie and Mickey were on Main Street and maybe a few others), but since there are so few Avengers and so little park time, it was like EVERYONE AND THEIR MOM wanted to stop. 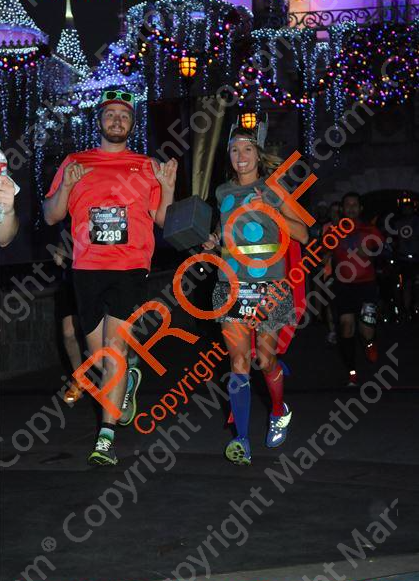 We saw that Minnie and Mickey didn't have a long line (maybe 5 people or so), I looked at Ryan and asked him if he wanted to stop, but I knew he wanted to PR, so we kept on trucking. 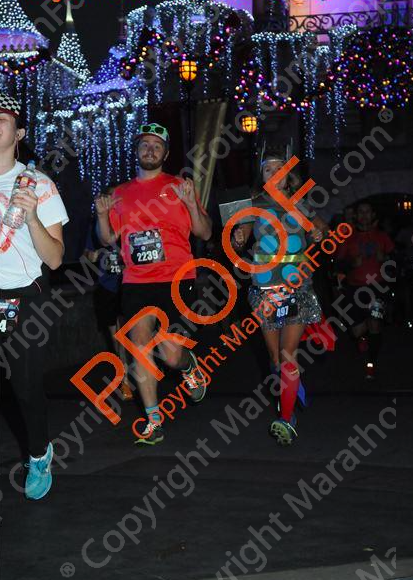 The strange thing about this course was you actually ran Main Street BACKWARDS, so instead of running TOWARDS the amazingness that is the castle, you ran away from it (a bit of a bummer, since that sight normally gives me goosebumps). 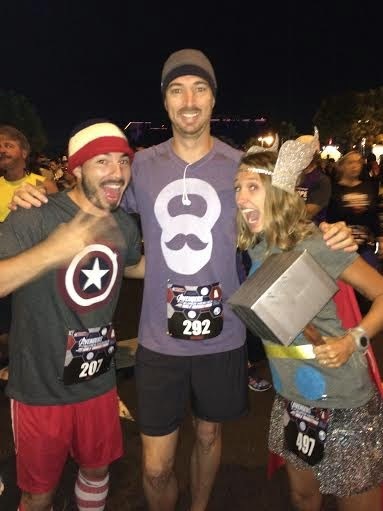 When we ran through California Adventure we saw Thor. 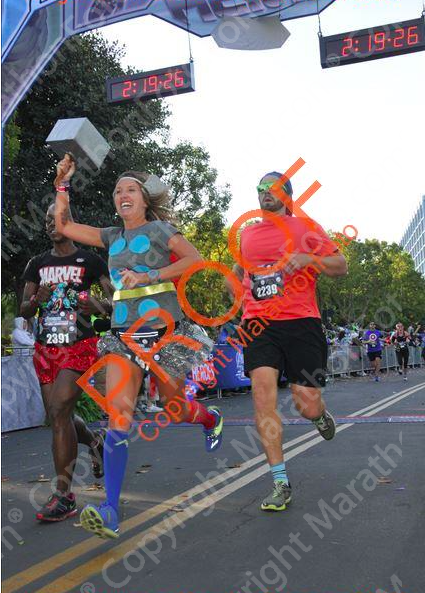 As with the other Avengers, the line was too long for us to justify a stop, but as he was between pictures, he looked at me, and we pointed our hammers at one another (I guess that is like a Thor wave, right?!). Pretty cool. corner of someone else's shot. At least Ryan got a fun one in Cars Land! with the Christmas lights on?! MAGICAL! Double shakes from Ry ;) Hammer from me! Once we got out of the parks you could feel it... THE WIND! I had seen the weather advisories, but wasn't sure if they would come true... HIGH WINDS were expected and EXTRA HIGH WINDS are what we got. Without the park walls to protect us, we were pretty much flailing in the wind while out on the roads. The first few miles after the park the wind was at our backs, but you could tell it was pretty crazy. 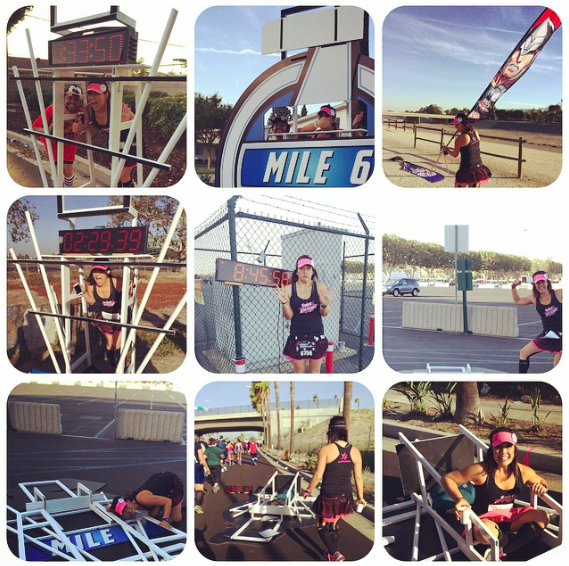 Borrowed from Kara's Instagram - they started taking pictures with the Mile Markers that had blown over. 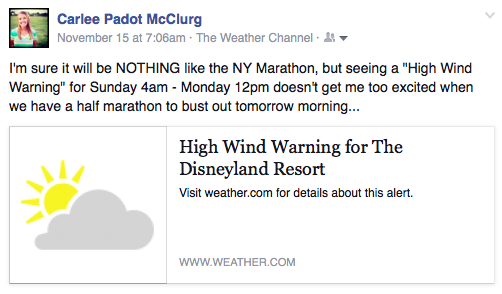 Borrowed from Fiona Shaffer's post on the Team runDisney Facebook page. Note the palm trees in the background as well. The course at this point was nothing special. All road running, not too many spectators and limited entertainment. I don't know if the weather effected anything or not, but there were some pretty boring miles out there. We ended up running along the Santa Ana River Trail. I have to say I LIKED IT! I am definitely partial because I do my weekly bike rides and long runs on a bike trail next to a dried up river bed in Oceanside, so it was sort of like running at home... Well, that is MINUS the sand and dust that was blowing into our eyes. 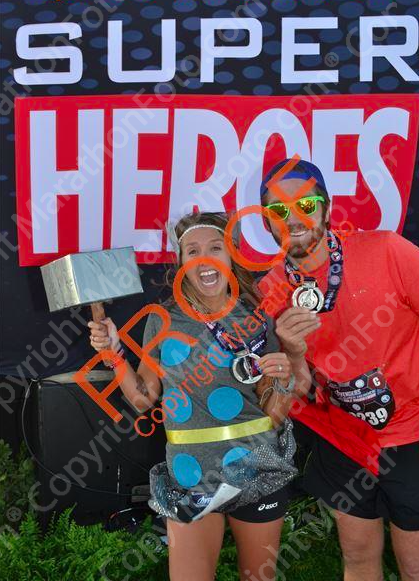 I had to use my Thor hammer as a shield to protect my face during some of the pelting (I believe someone mentioned the winds were in the 25-35 mph range while we were running with the gusts clocking much higher than that). 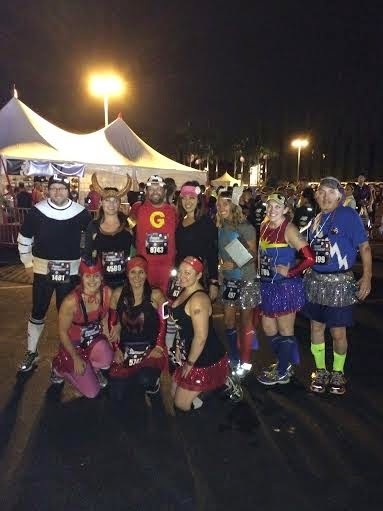 Also on this section of the trail there were a group of AWESOME super heroes! Ryan and I ran by and tried to high five each of them. Some of their costumes were AMAZING! They were really playing in character too - it was fun! The bike trail led us to Angel Stadium. This is where I had my first TASTE of HOW crazy the wind was. I grabbed a cup of water at the aid station outside the stadium and it was FULL of dirt. I honestly thought that maybe someone picked up a dirty cup off the ground and filled it with water. That is just how wild the winds were - filling the water cups with dust and rocks (YUM). 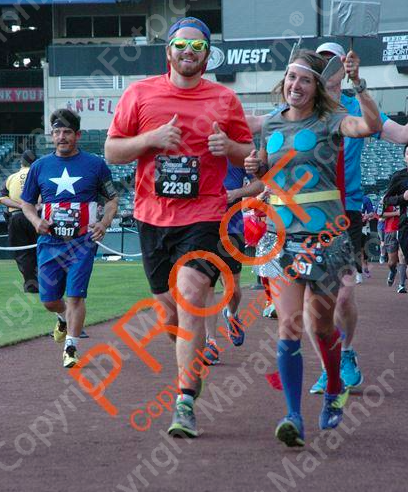 We ran through Angel Stadium, which was fun. I have to say though, I was a little disappointed. Having run through it during the Disneyland Half, the stands are filled with tons of boy scouts and girl scouts all cheering for you, giving out high fives, etc. This time there was a marching band on the field and a few people in the crowd (but when we ran by they were more concerned about taking pictures of themselves than cheering on the runners). 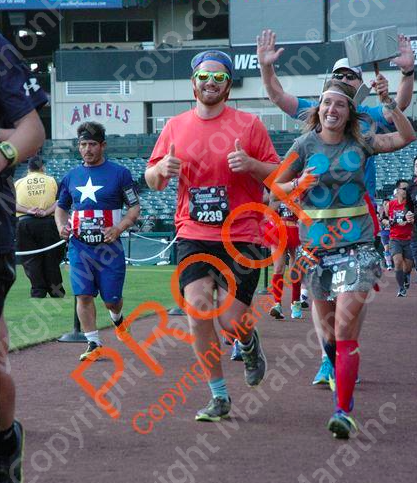 If this was my first time running through Angel Stadium I'm sure I would have been stoked, but since I had such high expectations from previous runs I was a little let down. Raising a hammer is like tipping your hat, right?! Outside of the stadium there were a line of veterans and other folks dressed up in period time costumes. Just like with the super heroes before the stadium, Ryan and I ran over and made sure to give them all high fives (and BIG thank you's to all of the vets). 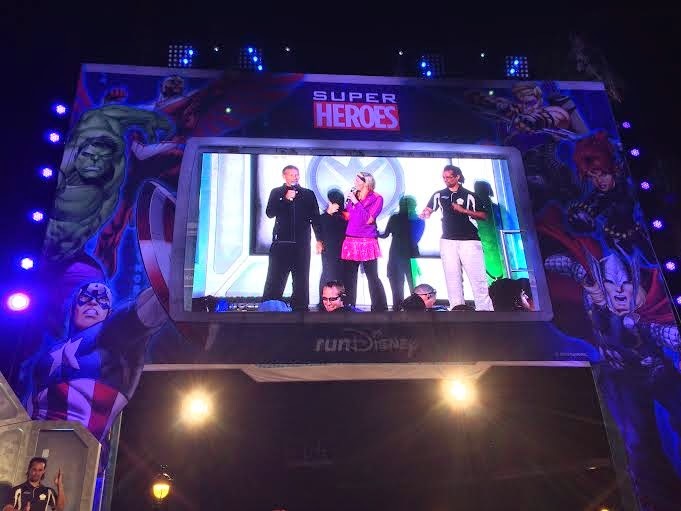 This was a nice little surprise (although I would have loved it to have been spaced out a little more... there were so many miles of nothing, so it might have been nice to have the super heroes, stadium, and veterans not within the same 2 mile spread). Then we ran a little ways with Jeff Galloway and his wife. They are two of the sweetest folks you may ever meet. Jeff and his wife were both wearing camouflage capes (along with camo pants) while rocking their Run Walk method. He and I joked about the wind helping our capes fly (but he mentioned he ended up having to tuck his into his pants because he didn't want it hitting anyone in the face). Around mile 11 Ryan looked at me and said "I don't think I'll be talking much these last couple of miles". I knew what that meant... 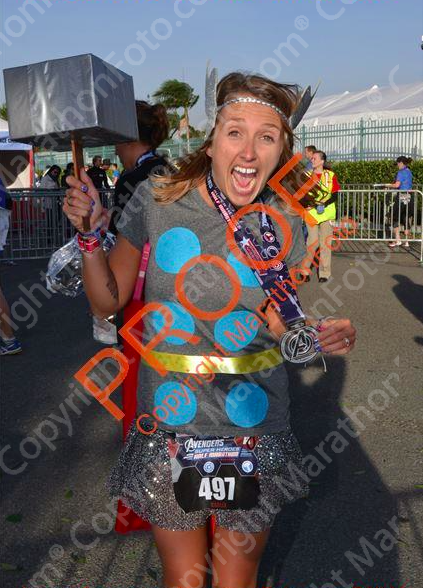 SHUT UP AND LET ME RUN ;) I can be a chatty-Kathy out there sometimes (I guess my thought is talking can take your mind off running and help the time go by quicker), but Ryan was looking to beat his current half marathon PR of 2:22:52 (which we got him at the 2013 Disneyland Half) and meant business. 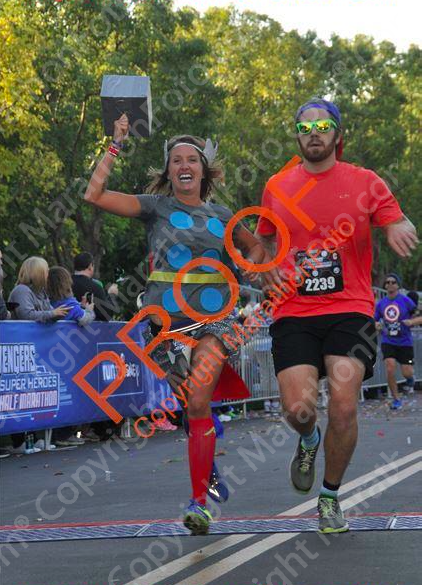 Ryan asked me to tell him when we were about a quarter mile from the finish. 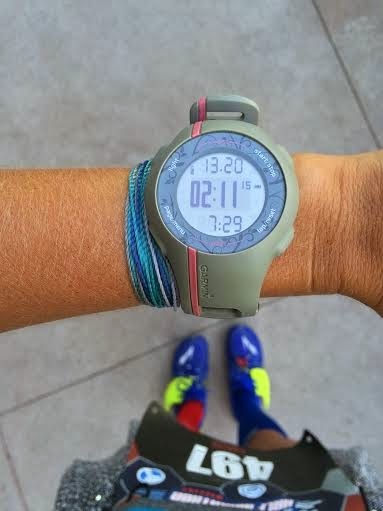 I let him know when I saw my watch at 12.85 miles (I wasn't sure how much extra distance we had picked up on the course since the mile markers weren't up and didn't want him sprinting for too long) and we were off! I heard Rudy announce my name (AND PRONOUNCED IT CORRECTLY WHICH IS HUGE!)! 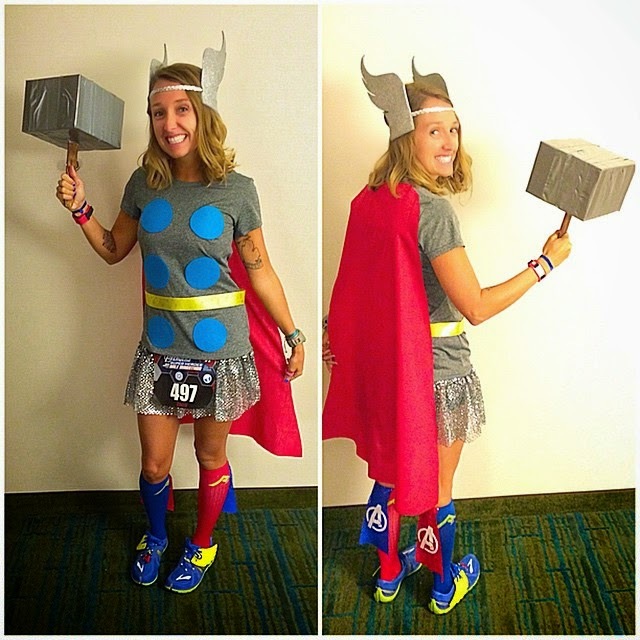 Then Carissa gave me a little shout out and I raised my hammer to wave. We charged in and crossed the finish line at 2:11:14 - OVER AN ELEVEN AND A HALF MINUTE PERSONAL RECORD for Ryan! 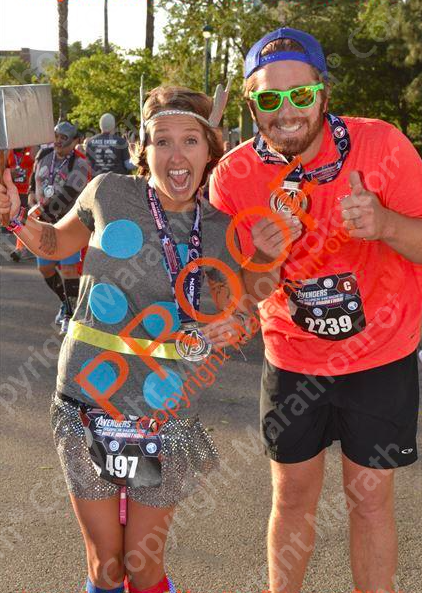 I think this was when Carissa yelled "GO CARLEE"
We grabbed our bling and then Ryan asked to sit down for a second. He was feeling fine, but wanted to catch his breath. After a quick breather we kept moving through the finisher shoot - grabbing our waters, taking a couple pictures, and picking up our goodie box and banana. An 11 and a half minute PR for Ryan! Thinking I might need to buy this one! I thought I would look for some of my speedy friends in the Family Reunion area after the race, but Mother Nature and runDisney had different ideas... As we walked in, we were told we had to leave. They said due to the high winds they needed everyone to leave the area. They even said they would be canceling the award ceremony (I guess they didn't want anyone impaled by flying tents or signs...). There was an official photographer by the stage so we quickly ran over to get a quick picture before being escorted out. Ryan and I are DEFINITELY Super Heroes! the wind was pretty bad, huh?! My medal is even spinning the wind was blowing so hard! Finished at 10:01/mile pace - BOOYA GRANDMA! Running with my hair down (I brought a hear tie in case it was too crazy, but was able to run with it down without an issue), wearing three capes, and yielding a hammer (albeit made of floral foam and duct tape) seems to work for me ;) The wind did "catch" my wings a few times (and when we were running directly into it for a while, I kept my head down to keep the flying particles our of my eyes, so the wings got a little floppy by the end of the race), but all-in-all I would consider it a successful race with a fun costume. 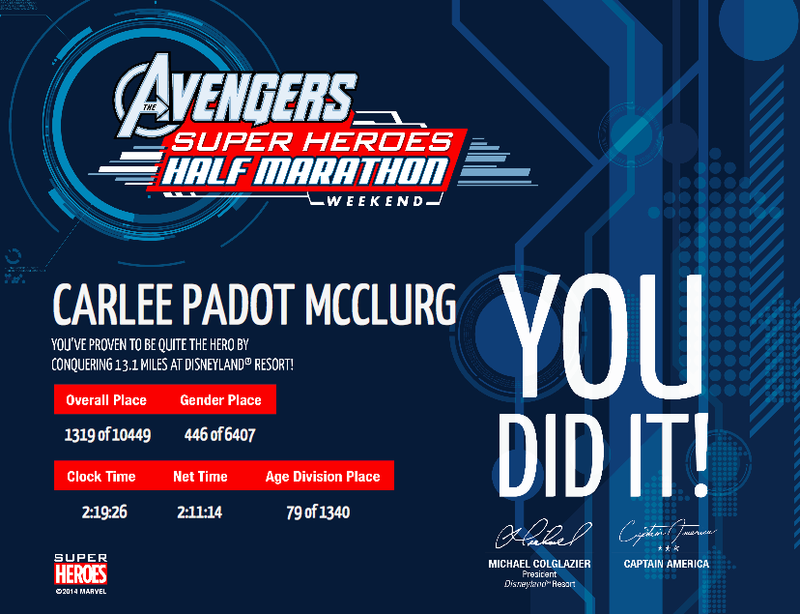 And Captain America even signed my certificate! Have you ever run with a prop before? Congrats to Ryan on the PR! You guys got some great photos! 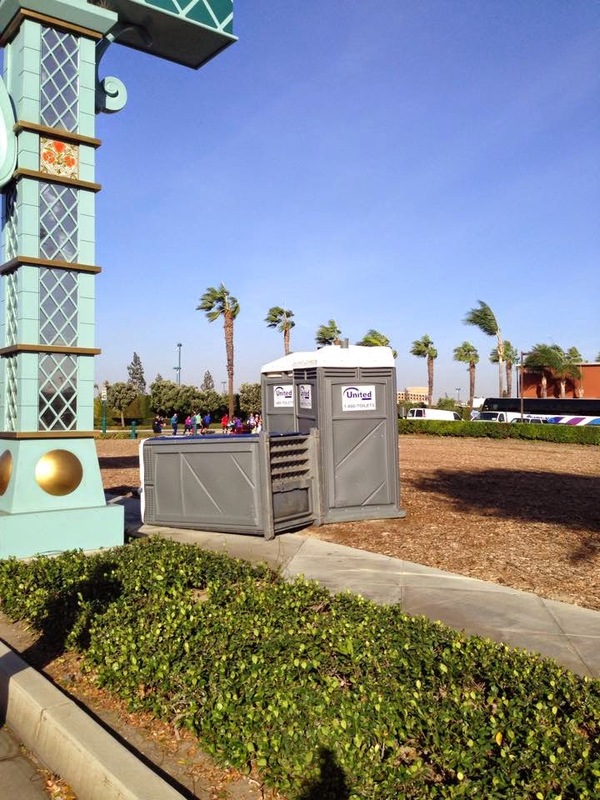 I kept hearing how windy it was that day, but I didn't see that all the mile markers and a porta potty had blown over! 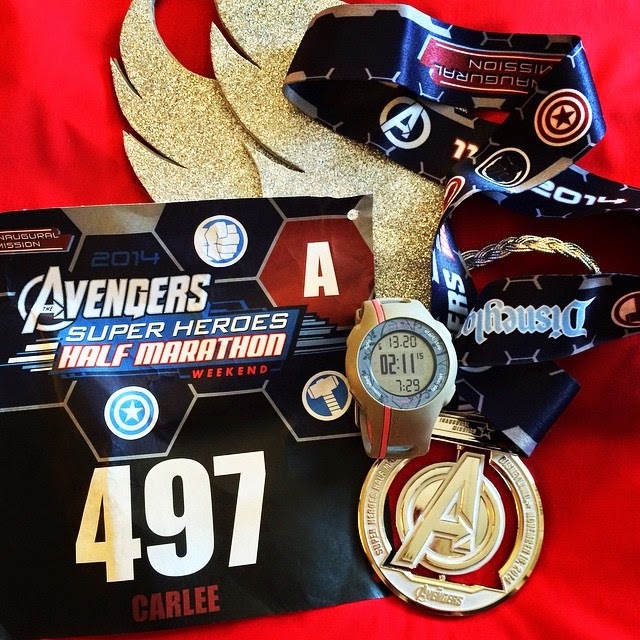 I've run a few windy races (including NYC!) and it definitely makes the run a lot more challenging! Also, it's definitely weird that they didn't have scouts or anything cheering in Angels Stadium...that's usually the best part of that!